The U.S. adopts the Silver Standard. The Coinage Act creates the first Mint in the U.S. Capital, Philadelphia. U.S. Settlers in North Carolina and Georgia pan for gold in streams and dig just below the surface. Later in the 1800s, technology improves and the first hard rock mine is opened in North Carolina to mine gold from its source. Silver and copper are added to smelted gold to meet fineness requirements. These alloys allow monetary coin value to be standardized. Improvements in mineral processing technology make the process more efficient. An example is water-powered stamp mills, used to break up gold ore for further processing. Before 1835, transporting gold from the south to Philadelphia for minting is a difficult and dangerous journey. The Mint Act establishes branches of the U.S. Mint in Charlotte, NC; Dahlonega, GA; and new Orleans, LA to process gold mined in the south, eliminating the need to make the dangerous journey to Philadelphia. 300,000 early U.S. settlers cross the country and immigrants from around the globe move to California in hopes of striking it rich. The California Mother Lode is discovered. The San Francisco Mint is created to turn CA Gold Rush ore into coins. Gold is discovered in Colorado. Comstock Lode discovery of silver near Carson City, NV. The Denver Mint is opened to process ore from the CO Gold Rush. Carson City, NV Mint is created to coin silver from Comstock Lode. Cradles and long toms are used by individuals to process gold ore.
Technology improves and corporations start to use hydraulic mining and dredging to increase production. In the Coinage Act of 1873, the U.S. embraced the gold standard and de-monetized silver. 96% extraction rate of gold ore is achieved by advancements in metallurgical techniques, such as cyanidation. The War Production Board closes gold mines during WWII. Silver and copper-clad coins decrease use of silver in US coins. The U.S. government deregulates the price of gold, causing an increase in demand. Before 1986 gold is primarily mined domestically in the U.S. or is obtained from secondary sources (scrap). The U.S. increases importation of gold after 1986. The U.S. Commercial Space Launch Competitiveness Act of 2015 allows Americans to keep what they mine on an asteroid or Earth's moon. The company Planetary Resources successfully launched test satellite A3R, bringing the company a step closer to mining minerals on asteroids, including gold. The world's oceans are estimated to hold up to 15,000 tonnes of gold. 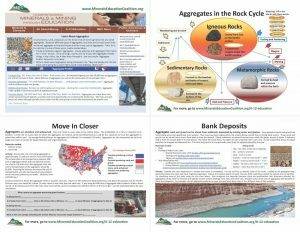 Each year, MEC partners with the American Geosciences Institute’s Earth Science Week (ESW) to provide educational resources across the globe at www.EarthSciWeek.org and in the ESW Toolkit. Participation in this initiative affords MEC the opportunity to reach a vast number of educators with education resources and to provide outreach materials to SME members and others interested in sharing the importance of mining and minerals to everyday life. 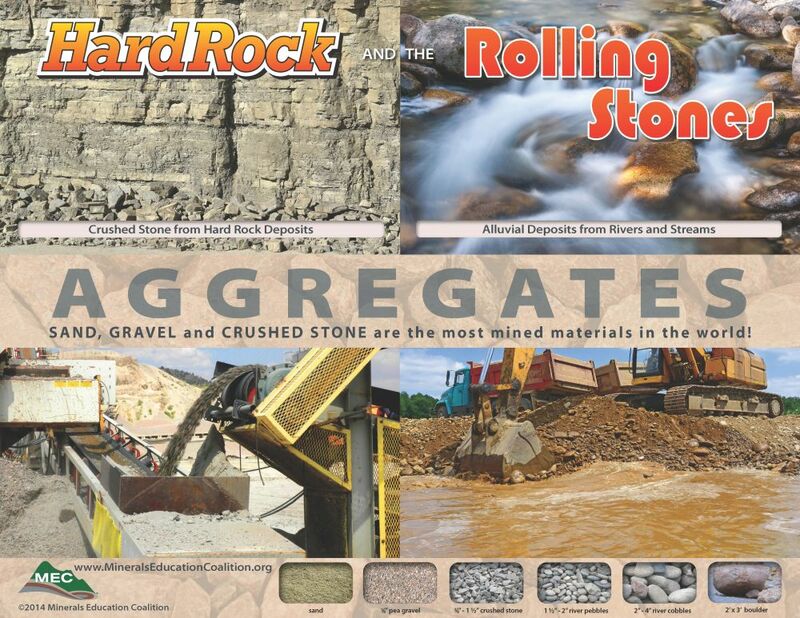 In collaboration with the Ohio Industrial Minerals & Aggregates Association and Ohio Aglime Council, MEC produced the “From Quarry To Crop” set of resources. The set includes a postcard and a calendar page in the Earth Science Week Toolkit, plus the activity and videos below. 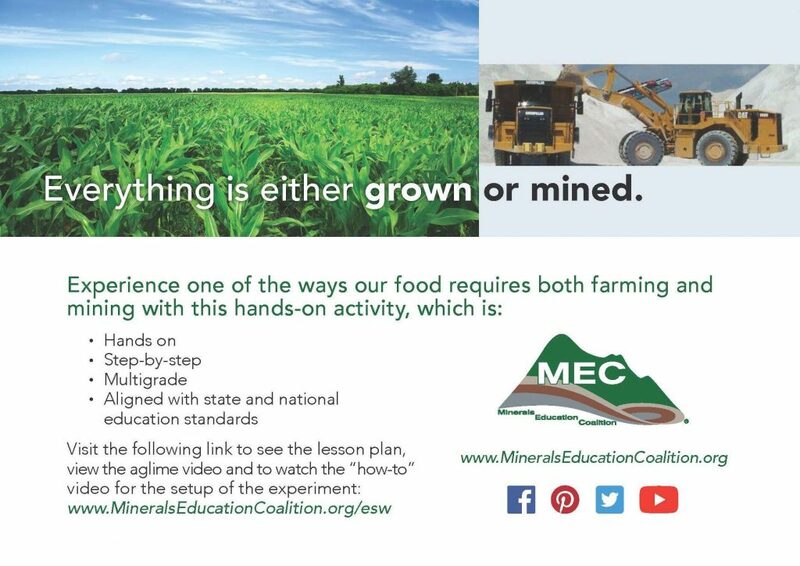 These resources let students experience one of the ways our food requires both farming and mining. 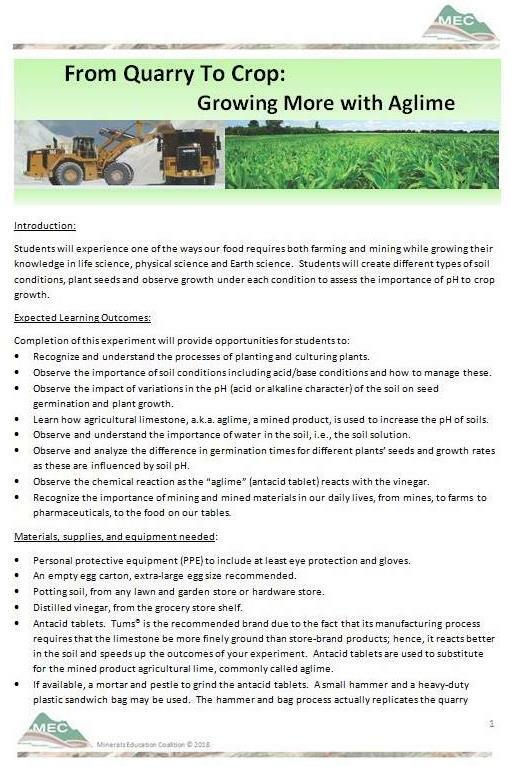 Students will create different types of soil conditions, plant seeds and observe growth under each condition to assess the importance of pH to crop growth. This step-by-step video demonstrates the “From Quarry To Crop: Growing More With Aglime” hands-on activity above. Aglime is natural, finely crushed limestone and dolomite rock. Aglime reduces the acidity of the soil, decreases the amount of fertilizer and herbicide needed, and improves water drainage and the growth of beneficial microorganisms. 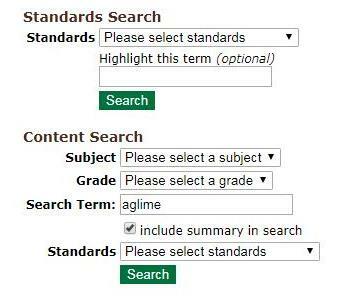 Example: Put “quarry,” “crop” or “aglime” in the Content Search “Search Term” box and check “include summary in search” to get information about these activities. Then you can choose from your state standards, or national standards such as Common Core or Next Generation Science Standards. 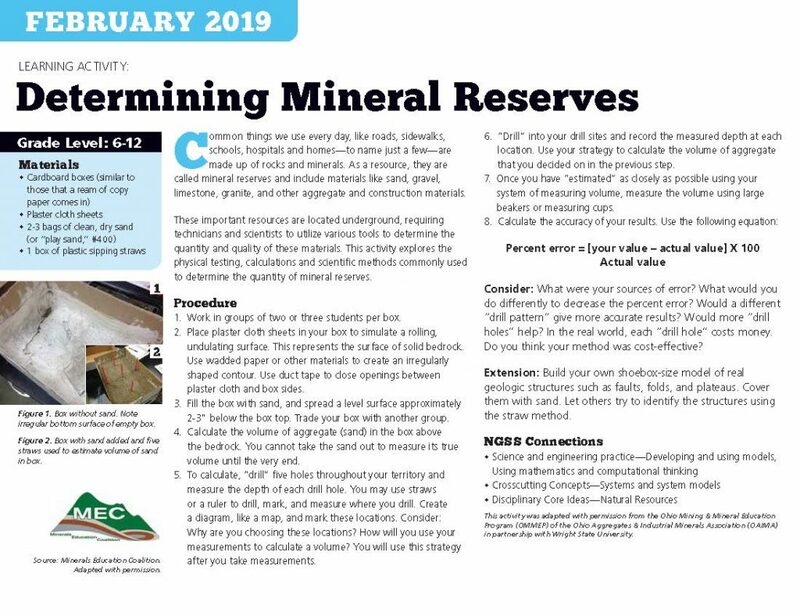 This activity explores the physical testing, calculations and scientific methods commonly used to determine the quantity of mineral reserves. The 20th annual Earth Science Week celebration (October 8-14, 2017) will promote awareness of what geoscience tells us about human interaction with the planet’s natural systems and processes. 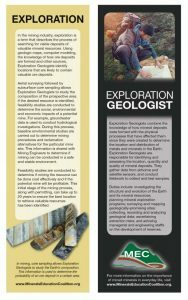 Copies of the “Earth and Human Activity” Earth Science Week Toolkit are free, and available for the cost of shipping and handling in the U.S. To order your Toolkits, please visit www.earthsciweek.org/materials. 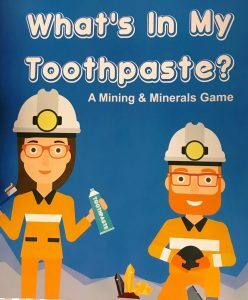 MEC’s new “What’s In My Toothpaste?” game, with glossy game board, is part of the AGI Earth Science Week Toolkit, along with the “A Paste With A Taste” calendar activity adapted with permission from Women in Mining. 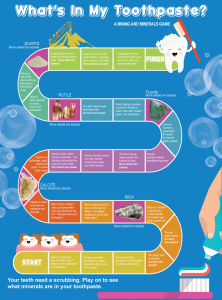 Click the image of the game board to download a sample PDF of the “What’s in My Toothpaste?” Game. 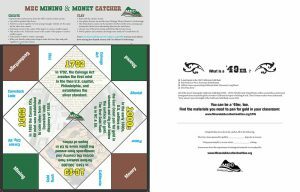 The colorful MEC Mining and Money Catcher is a fun, interactive that students can fold and play with as they learn about the interrelated history of mining and the money we use every day. 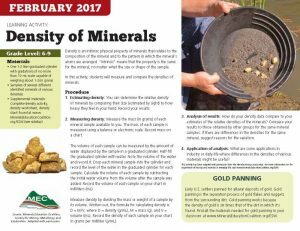 The MEC page from the 2017 AGI Earth Science Week Calendar is a Density Activity adapted with permission from the Nevada Mining Association. The greater density of gold allows it to be separated from sediment in gold panning. The rolling, responsive MEC Mining and Money Timeline above illustrates mining and money milestones from 1785 through the present, including the interrelated locations of the United States Mint. 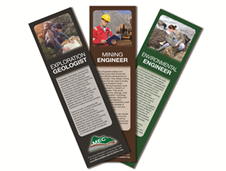 Three MEC bookmarks show the three processes in mining through the eyes of an exploration geologist (Exploration), mining engineer (Mining), and environmental engineer (Reclamation). 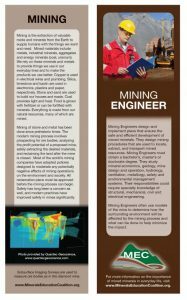 Science, technology, engineering and math (STEM subjects) are used by mining professionals throughout the industry. Purchase bookmark sets in individual sleeves here. 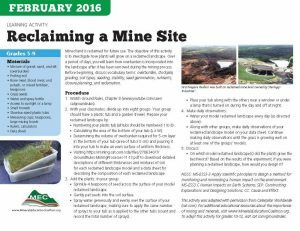 The MEC page from the 2016 AGI Earth Science Week Calendar is Reclaiming a Mine Site with permission from Caterpillar. The activity instructs students how to create a model reclaimed landscape in a plastic tub. As the students observe the growth of vegetation on one of eight model landscapes, they learn that specific conditions are needed to re-vegetate reclaimed mine sites. To view the Caterpillar Ground Rules video and access the accompanying 75-activity guide go here. 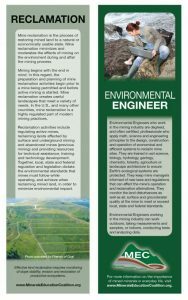 MEC recorded interviews with scientists and engineers in the mining industry to reinforce the messages presented to educators in MEC’s Earth Science Week bookmarks and calendar activity: how interest in STEM subjects can lead to a rewarding career in the mining industry. These interviews are available here. 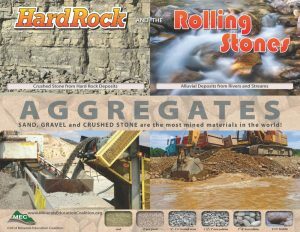 The colorful MEC Aggregates Poster has four 8 1/2 x 11 size K-12 lessons on the reverse side. Sand, gravel and crushed stone are the most mined materials in the world. Purchase the poster here. 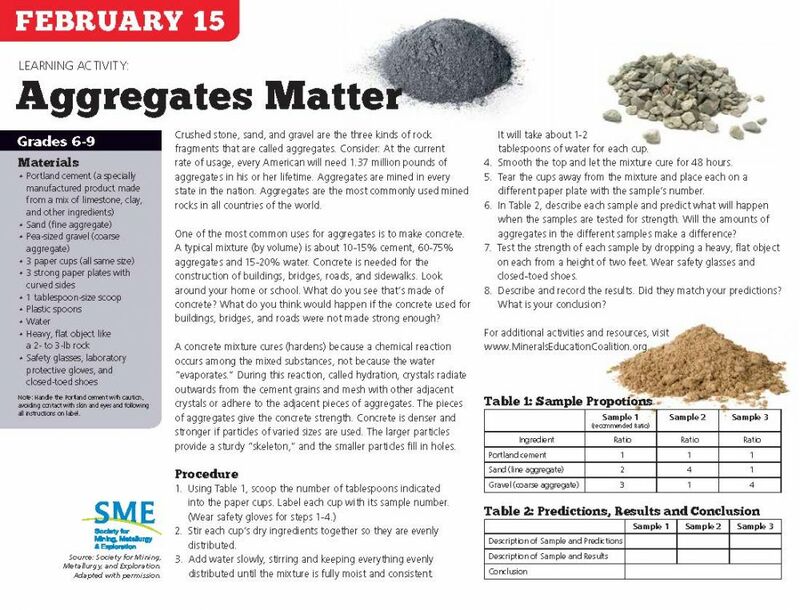 The MEC page from the 2015 AGI Earth Science Week Calendar is Aggregates Matter. Students compare concrete mixes containing different amounts and types of aggregates and test the strength of the hardened mixes. 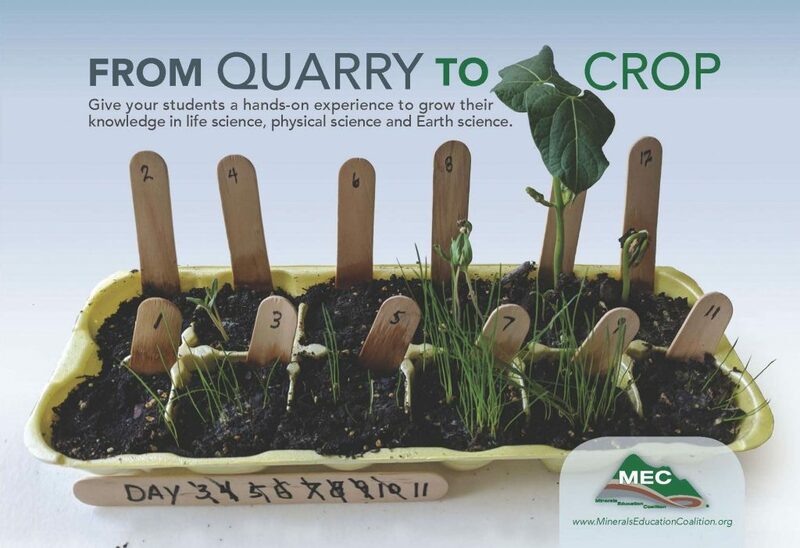 MEC provided a fold-out of the Soccer Minerals Mini-lesson for 2013 AGI Earth Science Week Tookit. 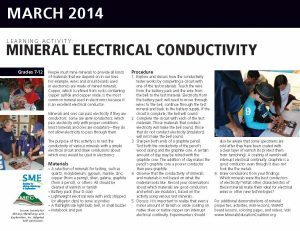 The MEC page from the 2014 AGI Earth Science Week Calendar is Mineral Electrical Conductivity. Students test the conductivity of various minerals with a simple electrical circuit and draw conclusions about which ones would be used in electronics.